Welcome back to Toy Aisle, io9's regular round up of the best toys and merchandise we want to start collecting dust on our shelves. 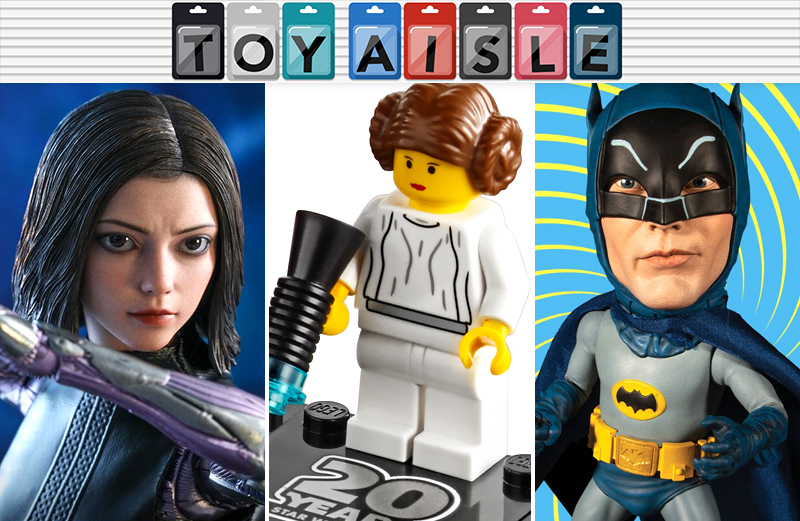 This week: Lego celebrates 20 years of Star Wars sets, Alita: Battle Angel gets its very own Hot Toy, and we check out a Doctor Who coffee press that is, unfortunately, not bigger on the inside. It’s hard to imagine a Star Wars movie hitting theaters without a new treasure trove of accompanying Lego sets showing up in toy stores, but it was only 20 years ago when the company took a gamble on producing licensed sets—which paid off handsomely. To commemorate the 20th anniversary of the first Lego Star Wars sets, the company is bringing back five of them, including a 125-piece, $20 Imperial Dropship; a 279-piece, $30 Anakin’s Podracer; a 250-piece, $30 Clone Scout Walker; a 309-piece, $40 Snowspeeder; and a 1,007-piece, $120 version of Fett’s Slave I. Why buy all these sets again? Each one includes a special edition 20th anniversary minifigure on a display stand. The movie adaptation of the beloved Battle Angel Alita manga might not be too hot, but Hot Toys’ own take on the titular cyborg warrior at least celebrates what is apparently the best part of the film: Rosa Salazar and her big ol’ CG-enhanced eyeballs. Maybe it’s just because it’s an action figure rather than a CG creation we’re expected to treat as “real,” but the giant eyes don’t actually seem as bad as they have been in the trailers for the movie. Given all the focus on them, Hot Toys have even made the individual eyeballs posable so you can have Alita casting her enormous eyes in any direction. As well as that—really the only feature this figure actually needed—she comes with a sword to fight with, various hands, a set of clothes to cover up her robotic body outside of combat, and even...her own heart to hold in her hands? That’s certainly not creepy at all. Alita will set you back the usual $230-ish when she eventually releases in early 2020. If your first taste of video gaming came from a bunch of six-foot-tall boxes crammed inside a dark corner of your local shopping mall, New Wave Toys’ Replicades will let you recreate the arcade experience in your own home. You don’t need to sacrifice your entire basement, either, as these sixth-scale recreations stand just 12-inches tall. Following up on the original Centipede version comes these Tempest and Street Fighter II: Champion Edition mini arcades featuring three-inch screens, and the same controls as the originals—just much tinier. The SFII cabinet even includes an additional tiny controller for two-player action. Both Replicades are available for pre-order now, with Tempest setting you back $120, while the SFII version is discounted to $100 for a limited time. A list of the most stereotypical British things would undoubtedly include the royal family, telephone booths, Doctor Who, and coffee? This Tardis-themed coffee press helps the long-running British sci-fi series expand its fanbase to countries other than the UK, but for added authenticity you’ll want to toss a couple of tea bags in here in lieu of coffee grinds. It’s $40 from ThinkGeek, with a capacity of 34 ounces that doesn’t change even if you somehow find a way to climb inside the press. We’ll leave it to you to decide if this 51,300-piece, 342-inch long puzzle actually qualifies as the world’s largest or not. It’s definitely gigantic once fully assembled, but read the fine print and you’ll discover that the box actually contains 27 smaller individually-packaged 1,900-piece puzzles that Voltron together to create this monstrous mural. At $560+ it isn’t cheap, but it’s guaranteed to keep all your visiting family members quiet and distracted for at least the next 10 Christmas holidays.